The ARL is a non-contact, co-ed, social hockey league for players that want a less-competitive atmosphere. We accept rookies that are just learning the game of hockey and skating as well as players that have been playing a while but enjoy the non-competitive, non-aggressive game we play. Open to Adults 21 years and over, the ARL league rules are designed to ensure the safety of our players and enjoyment of the game. NON-CONTACT – All participants, in addition to the rules of the game must actively avoid potential collisions whenever possible (offense and defense). We are a hockey league for beginners – we call ROOKIES. This is what the ARL is all about. Our games are played in a friendly manner (with ARL Spirit), which means we value sportsmanship, safety and fairness to all members of the team. In the interest of fairness and sportsmanship, no team may score more than 5 goals more than their opponent at any time. Any goals scored after that maximum will not be counted or recorded. We ask that stronger teams try to help make the game even out as best they can or at least stop scoring. All participants, attackers and defenders, must actively avoid potential collisions whenever possible, even if this means loss of advantage, puck possession, or scoring chance. 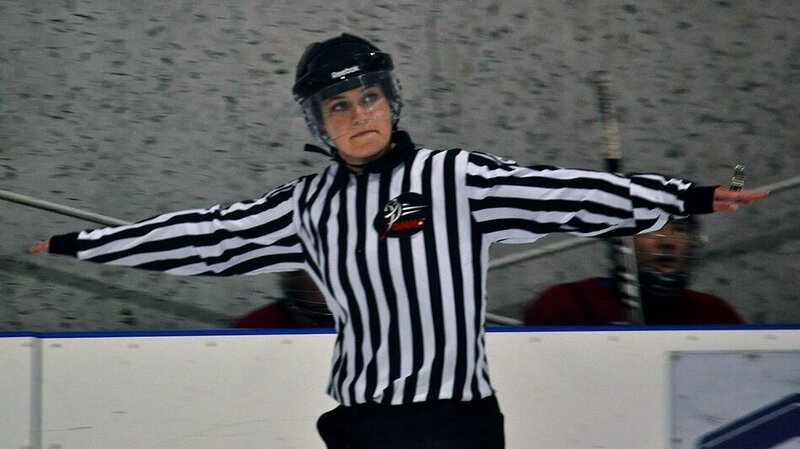 Failure to do so will result in a minor penalty and/or a Game Misconduct at the discretion of the Referee. This means that all players must make every effort to avoid collisions with the opposing team, regardless of the situation on the ice or the calibre of player. You must be aware of the players around you at all times. You are not allowed to ‘play the man’ and must at all times try to play the puck. If you see a collision about to occur, you must make every reasonable attempt to avoid it. If a player enters the goalies’ crease with a skate or stick (with the exception of retrieving a loose puck) the referee will blow the play dead and a faceoff will take place in the neutral zone. This rule will be enforced throughout the season because as a league we want to ensure that we are protecting our goaltenders. This may result in a lot of whistles during the games played over the first few weeks but we hope as the season goes on players will be more aware of the rule and stay clear of the crease. Players DO NOT cut to the net in an aggressive manner – it almost always results in a collision. We are strongly discouraging players from cutting to the front of the net with the puck in an attempt to score. While ‘crashing’ the net may look enticing, there is a strong potential of a high impact collision with the goaltender which may result in injury. This is a play more suited to a league with a higher level of competition. As we have frequently noted, safe and cooperative play is paramount to the ARL mission. Due to the fast pace of the game calls related to this rule will be in the hands of the referees. While there will be no rule AGAINST cutting to the net in an attempt to score, if contact is made with the goalie violating players will need to live with the consequences. Players who make incidental contact with the goalie while attempting this play may face a two minute minor penalty at the referee’s discretion. Players who make direct (not incidental) contact with the goalie while attempting this play will be assessed a five minute major, a game misconduct and a suspension at the discretion of the committee, in consultation with the officiating referees. In the name of consistency, and to be sure this rule is enforced the following penalty structure will be implemented for players violating this rule: First offence, a 5 minute major and a game misconduct, plus a minimum one game suspension. Second offence, a 5 minute major and a game misconduct plus a minimum two game suspension. A third offence will result in expulsion from the league. Once again, we want players to have fun and we want friendly competition in the spirit of the league, but the level of play must exist with an emphasis on player safety. Slashing (hacking – no attempt at the puck) is not allowed, well except for one obvious exception. Two majors in a season will result in banishment from the league without refund. ARL will pride itself for a “clean” reputation. Players pay to have fun and not to get injured. Players are not allowed on the ice until the Zamboni doors have closed. If you do go out early – DON’T shoot any pucks until the gate is closed. Don’t shoot pucks in warm up at the net if someone is posting the net. We welcome player input and suggestions at any time. if your team is without a goalie at the start of a game we will run the clock for 5 min then begin playing without a goalie. The shorthanded team will play with a sixth player that will act as a third defenseman. Every effort will be made to get a goalie from the ARL – i.e. next available or if a no-show situation, the goalie from previous game etc. There will be no shots allowed from outside the blue line and all shots will need to be low and not hard. The game and all stats will count as normal. Goalies are allowed to play the puck up to their blue line as long as their actions are considered non-aggressive and safe. Crossing the blue line will result in a penalty. We do stop time for the final one minute of each game – if there is a 5 goal difference then we do NOT stop the clock. We do not stop time for penalties – we ask that everyone move the process along as fast as they can and get lined up for the next faceoff as soon as possible. We do stop time for player injuries – It doesn’t happen often thank goodness – we usually stop the clock and look after things then get the game going and it ends up running late – if it’s a longer time then the refs take a few min off the next period. We try to catch up times in each game going forward. There are no time outs – Captains can talk to the refs in between periods if needed. Our refs manage our timekeepers so any concerns about the clock need to be directed to our refs and not directly to our scorekeepers. Minor penalties will result in the offending player being charged with a 2:00 minute penalty (once you have 3 minor penalties – you LEAVE the game immediately – you serve that 3rd penalty in the dressing room). Unsportsmanlike conduct: trash talking, arguing with refs, swearing, abusive language, slamming bench doors, swinging stick against boards, throwing of any objects and any unsportsmanlike conduct will result in a minor and at the discretion of the ref – you will be immediately asked to leave the game. You may be further assessed a suspension at the discretion of the convenors. No slap shots. A slap shot is considered a very hard shot taken above the ankle. A slap shot and even a fake slap shot will result in a 2 minute penalty so please don’t even try or test us, we will call it if even remotely close. Intentionally screening the goalie is not allowed – this is NOT the NHL. A player is allowed to have a skate in the crease as long as they are not acting aggressively. No Diving – defined as deliberately leaving your feet during the play. When a player intentionally leaves their feet to block shots on defense or when they dive in order to try to stop a break-away, that player will be assessed a minor penalty. NEW Winter 2018-19: When a team will be short-handed when play resumes, the faceoff will be in that team’s defending zone. Exceptions may apply. Hotdogging is a penalty that we call on a very skilled player that goes end-to-end and scores a goal. A hotdog call could also apply to an aggressive defender. This is a discretionary call. This penalty may be called if a skilled player takes advantage of a weaker player on the opposing team in such a manner that the ref deems it unbecoming of an ARL player! In all our divisions including our Rookie division, we don’t want players that score their two goals every game – we expect those better players to support the rest of their team and not try to control the game results. We know this isn’t black and white. The hotdog rule is something the refs can use to game manage. It is called more often in beginner but CAN be called in rookie level as well. If a team is winning 4 – 0 and someone from that team runs blue line to blue with the puck and scores, they’ll call that hotdogging. That’s just one example. The thing about the ARL is that not all rules can be written in stone. The refs have to use their discretion keeping in mind that games are supposed to be fun. We will back them on whatever they feel is necessary. So people – PASS the puck and be helpful! Division 1 is excluded from the hotdogging rule. However, we still ask that players still continue to play in the ARL spirit. Suspended player playing or player that is not on the team’s roster. * These rules are for the safety of the players. Players must be on the team’s roster or else that player is considered a Ringer. SUBS are allowed, including goalies through contacting the POOL coordinator ([email protected]). Players may sign up to join the pool as forwards, defense or goalies and the Pool Coordinator will be responsible for managing the player call-ups. Pool players and goalies will pay a fee per game due at the game. Having a player play that is NOT on the roster or part of the Pool will result in a forfeit of the game. Only the convenors or pool coordinator can add players to any game. Team captains are not allowed to select or ask other players to join their game at any time. Players are not allowed to canvass for extra games at the rink. New: Pool players are required to have their name and number on the game tracking sheet. Please visit the timekeeper at the beginning of the game and have it recorded. Captains are responsible for ensuring the Pool player appears on the list. Penalty shots are NOT stop time – we ask that everyone move the process along as fast as possible. As a courtesy to the other teams, please wait until both teams playing have completely left the ice before going on the ice yourselves. Quick faceoffs (make your line shifts between whistles quick), refs will drop the puck regardless if the centreman is ready. Crease rule. Do not act aggressively in front of the net. The refs will whistle the play dead if there is heavy traffic in front of the net – they will not wait to see the puck completely covered up. Stoppage of Play will be called if a goalie is hit in the helmet by a puck or if there is too much traffic in front of the net or if the ref loses sight of the puck. Maximum 2 goals per player per game. If a player scores a 3rd goal in a game it will not count. That may affect the actual resulting score of the game. Regarding our ARL, we want the safest, smartest arrangement possible for our players and goalies. We use 2 experienced refs for all games… (may or may not be carded/certified refs) but must be experienced – if scheduling or no show – we will add an available experienced player ref to join the experienced ref or even go with two experienced player refs if we have to – but we will not use any rookie refs in this division unless we are forced to. If scheduling is a problem for any reason we will use any player refs available to us and explain to both teams that we are in that situation. We will always demand that players and any coaches or bystanders do not abuse our refs at any time. Swearing at them or yelling etc will result in an eviction or suspension at the discretion of the convenors. Helmets with chin straps are MANDATORY – no exceptions. What equipment will I need? ARL requires a minimum half shield with mouth piece or cage w/o mouthpiece. Again, safety is our #1 concern. Teeth can be replaced but eyes can’t! At any time during the game, if one team is ahead by 5 goals they are required to LIGHTEN UP until the other team scores one making it a 4-goal difference. If the team with a 5-goal advantage scores a sixth goal it will not count or be recorded. But NO penalty will be applied to this rule. Since we are after all a CO-ED hockey league, we never want to see a full men’s team on the ice. Some of our rookie division teams only have 2 or 3 women on their roster, so if they aren’t going to be at the game, we will get a female pool player to fill in so that your team has at least one. All teams must have minimum one woman on the team for each game or it is a forfeit. We ask Captains to let us know who will be away and what their needs are each game. We will also ask all female ARL players to join the new Women’s Poolie List (if they are interested) for the season and we will look after getting your team a female replacement. If the situation should occur that the only female player on a team gets ejected from a game then that team will forfeit to their opponent. While some may feel this is a harsh punishment for the team as a whole we need to understand three things. 1. This is a social Co-Ed league. 2. The situation where a player (male or female) needs to be ejected is rare. 3. The situation where a team has only one female player on their roster is relatively rare. A typical ARL team has at least 2-3 female players. As a league we are ultimately most concerned for the safety and fairness of all players involved. The enforcement of the rules will come down in favour of the majority of the league and our primary objective is to support the Co-Ed vision of the ARL. If you bump into someone male or female and they fall down, stop and ask them if they are OK before rushing off to score your goal. We expect co-ed courtesy in the ARL. Broken Stick – A broken stick is one which, in the opinion of the Referee, is unfit for normal play. A player without a stick may participate in the game provided they drop the broken stick. They MUST NOT skate with the broken stick. A minor penalty shall be imposed for an infraction of this rule. A player who has lost or broken their stick may only receive a stick at the players’ bench or be handed one from a teammate on the ice. A player will be penalized if they throw, toss, slide or shoot a stick to teammate on the ice.